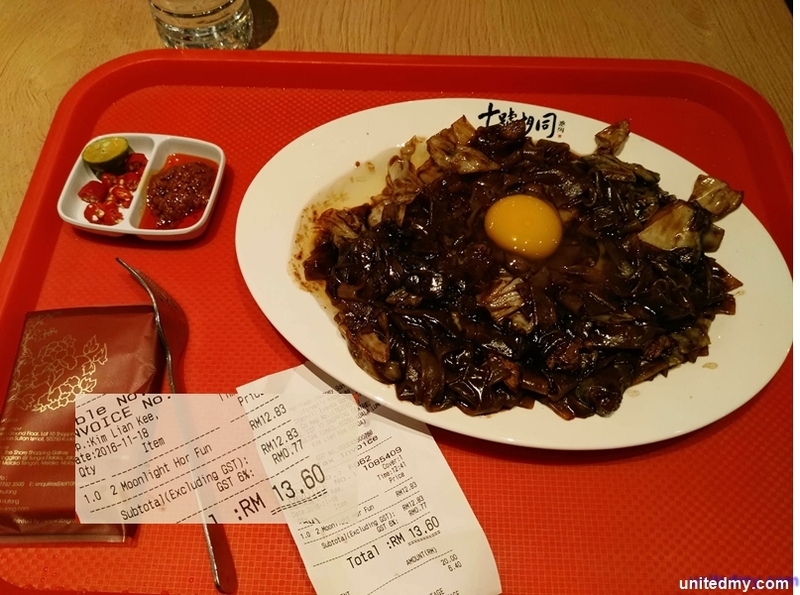 KLIA2 fee and Visa charge on every ticket purchase. No Visa processing charge, there is no need to use online banking method to buy Airasia ticket with a RM4.00+ fee. Besides, news about KLIA2 fee abolished early January 2019 only applied to those board flight through Kuala Lumpur International Airport 2. The issue with visa charge was a serious matter prompted Bank Negara's public statement. Rumor said the culprits behind exaggerated visa charge are now being charged at court early January 2019. The exorbitant visa processing fee caused lots of complaints among the foreign travelers. Passenger service charge is the airport charge. Every passenger are required to pay RM11.00 one-way. 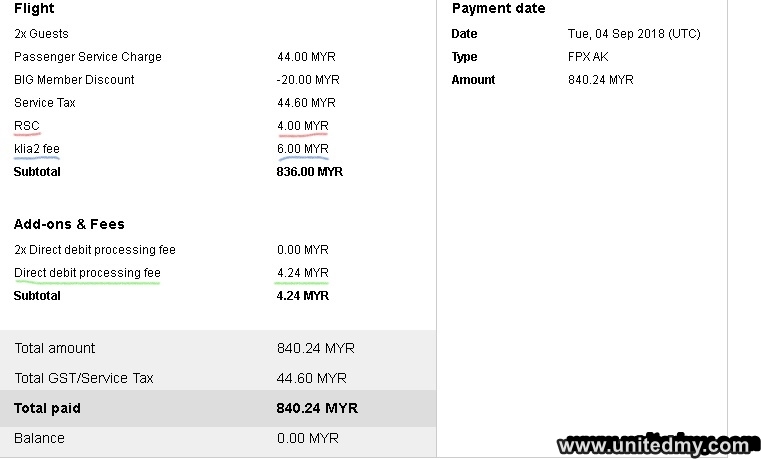 On a return ticket for two persons, airport earned a total of RM44.00 in any airport nationwide. 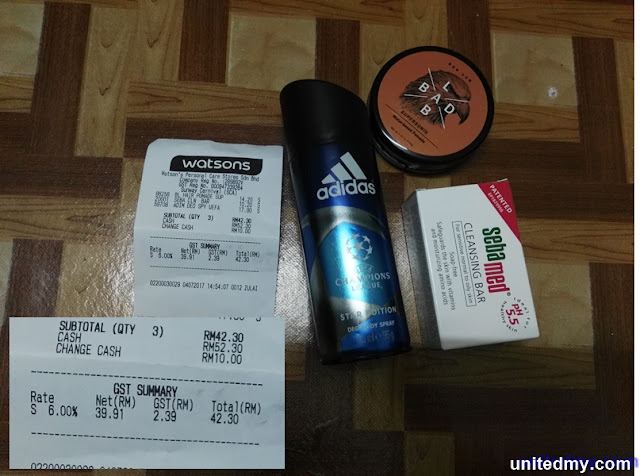 Not to mention, shop rental and really nice RM20.00 buffet. 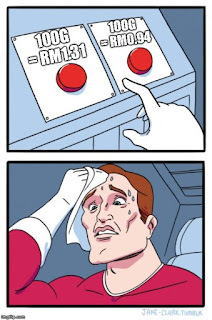 On top of that, RM3 klia2 fee was a fee needed to be paid by every passenger onboard on KLIA2 until it was revised on early January 2019. On a return ticket, RM6.00 was a bearable cost. No doubt there was transparency in Airasia ticket. The dire issue was not just KLIA2 fee or the RSC believed to be implemented in 2018. The issue was "Visa charge". One of the cheapest fee to get Airasia ticket through online during 2017 - 2018 was "Online banking". 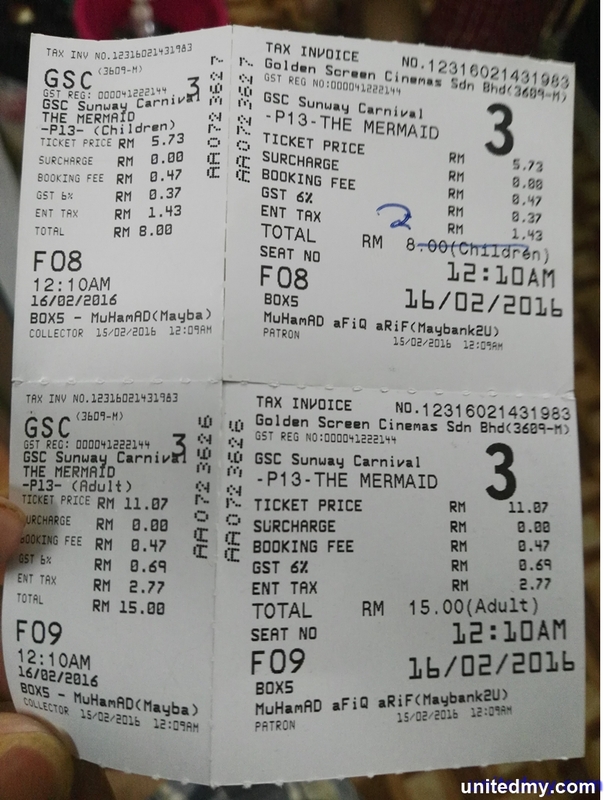 The truth about Airasia ticket system is purely amazing. Like a real-time ticket service. The proof is the ticket system is able to do update after I paid cash at the counter on flight day. The RM79.50 charge was not previously in the online receipt, updated into the online receipt after I took the flight. 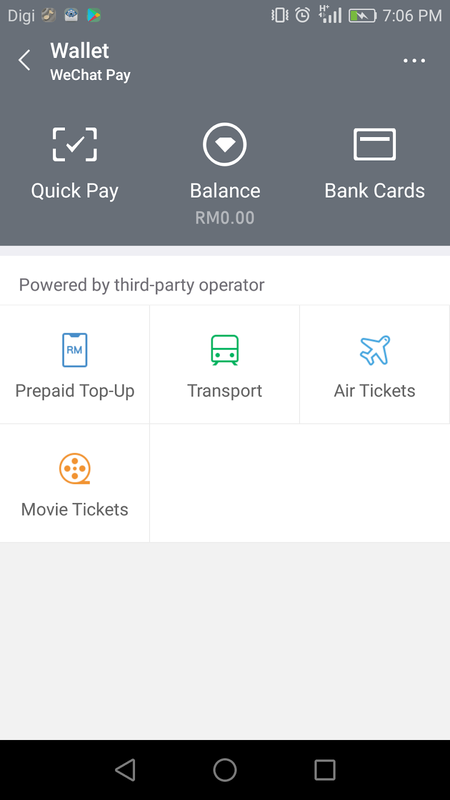 No one in Malaysia had a right mind to make an Airasia booking using their debit/credit card simply because there was a charge higher than the online banking. 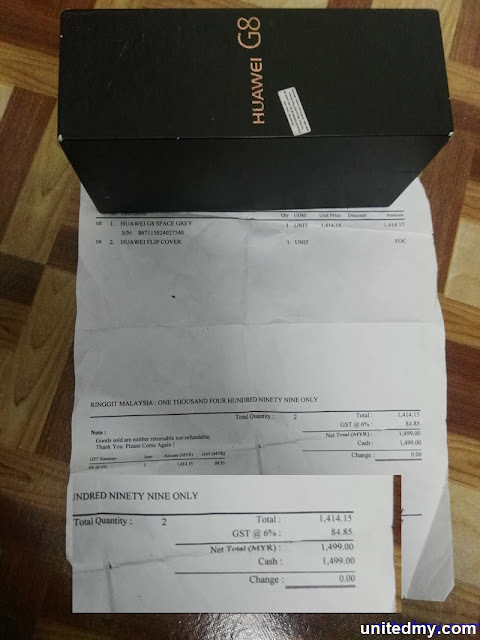 The card offered by Airasia to waive processing fee, it was just not doable and has cost to bear too. Is West Malaysia chicken way expensive than East Malaysia ? 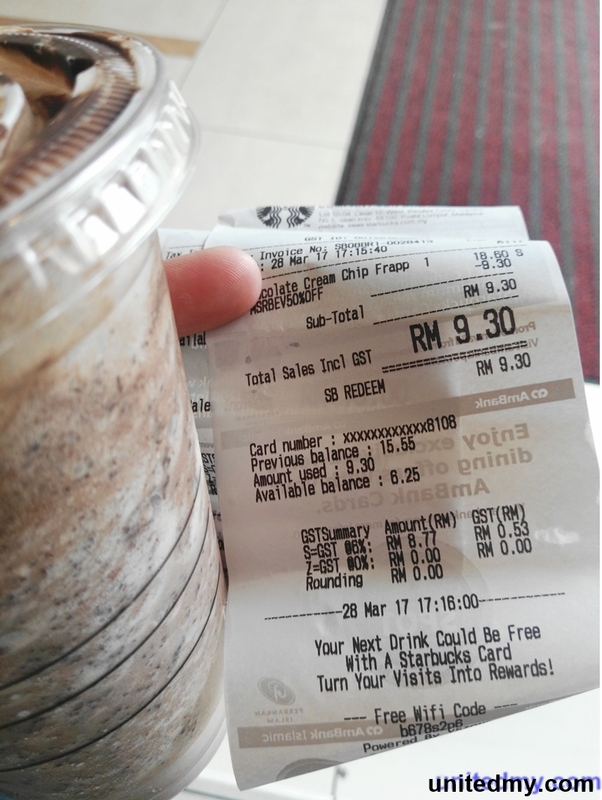 Nowadays, you are not consider lucky to get 100g chicken thigh for RM1.00. There are RM0.90 for 100 grams of chicken thigh in east Malaysia. 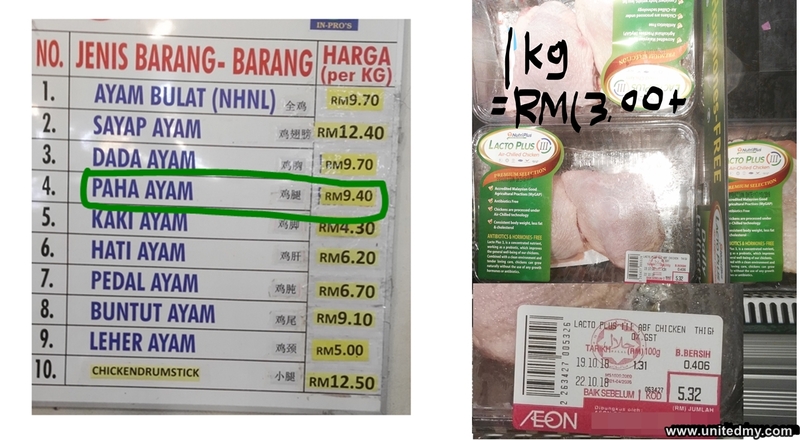 Not much effort in this comparison simply to point out there are very little price gap between West and East Malaysia chicken price.In fact, chicken price is not fixed likened to Malaysia petrol price. There will be fluctuation in local produced chicken but rarely seen it actually raised to RM15.00 per kilo. 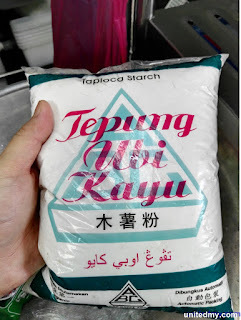 Although Kuala Lumpur is a big city, East Malaysia food price are catching up real quick. 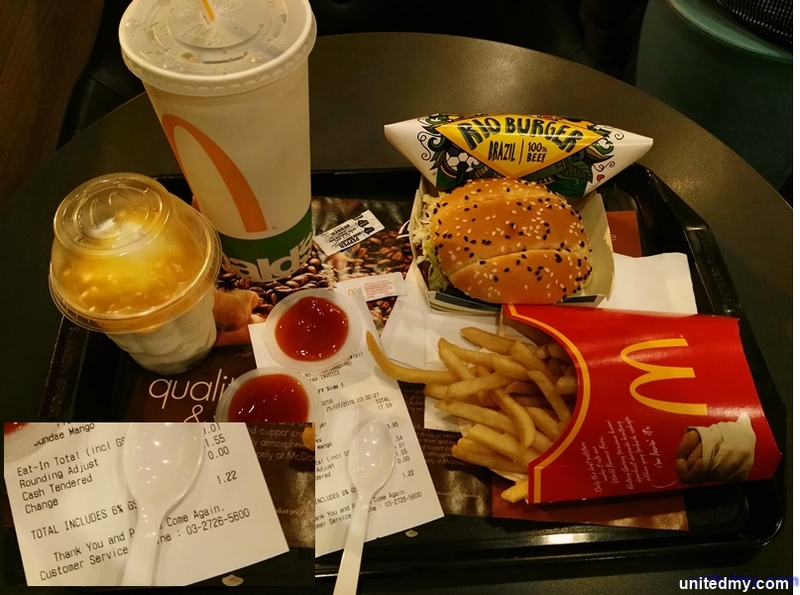 Most of restaurant food prices are following West Malaysia standard. Frankly speaking, West Malaysia restaurants with air-conditioning and nice interior setting are growing rapidly attracting younger generation and affluent community to try their foods in an exchange for higher food price. 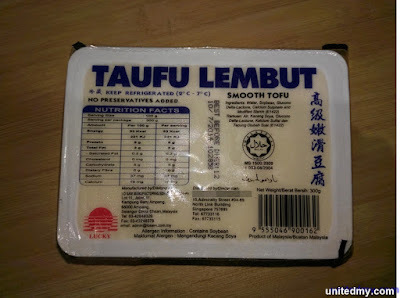 For more extravagant food, one should easily find it at West Malaysia. 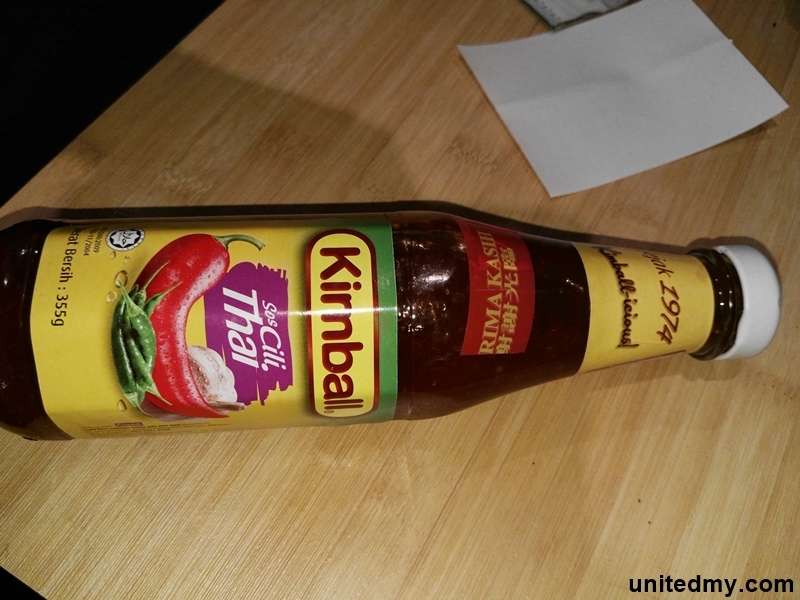 Neither West or East Malaysia restaurants used imported chicken. High-end hotel restaurants may use the same local produced chicken as the open-air restaurants. The support price for local produced chicken priced at RM8.50 and the ceiling price could be at RM14.00 per KG. Wechat is a huge mobile app among the Mandarin-speaking countries notably China. However, there are lots of social networking apps offers the same functionality. From a random statistic shown that Hong Kong and Taiwan people prefer "Line" developed by IT company from South Korea. As if the app Line is not usable, they would prefer "WhatsApp". 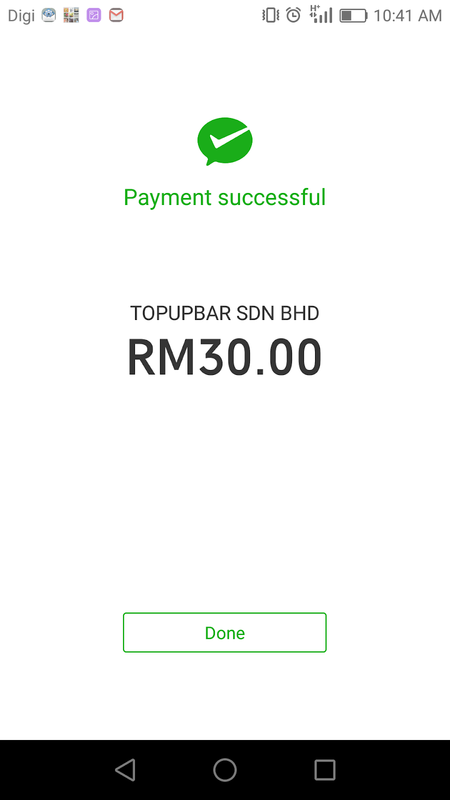 There are huge differences between Wechat version in Malaysia and China. China version of Wechat allows users browse movies and make daily transaction. They are strong believer of cashless society. Whereas, Malaysian are generally go to stores with their smartphone and wallet. 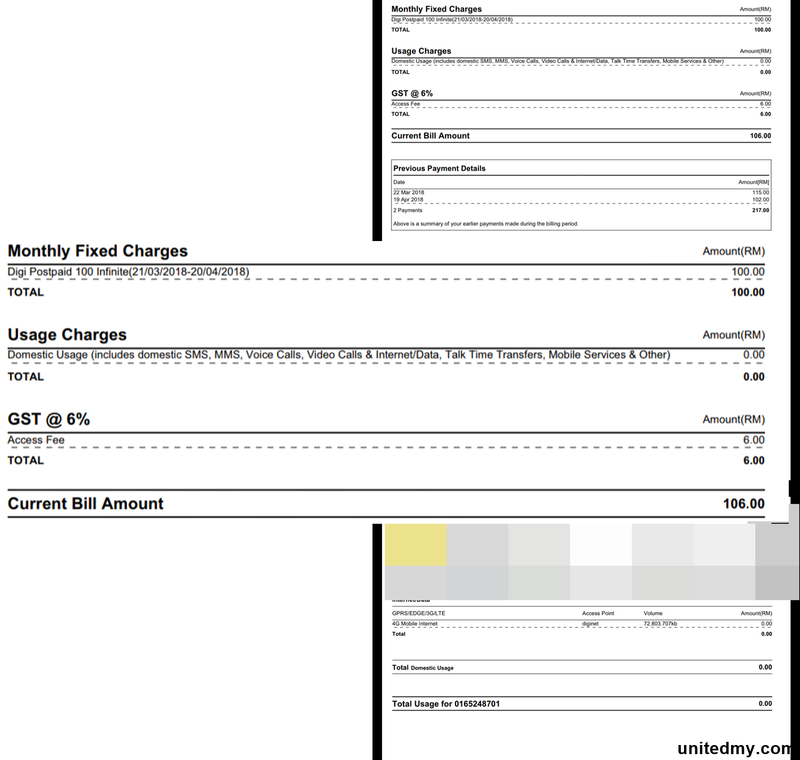 The term "Cashless Society" is still very fresh and new to them. Lack of apparent benefits of cashless further slow down acceptance on this phenomenon. It will take awhile to witness common traders / sellers / hawkers putting up barcode allowing buyer/patron pay with their smartphone. Besides, nation with fewer population and slower internet speed may not be an ideal place for such ground-breaking innovation. A nation with large population and with faster internet speed is able to reap benefits in cashless society with consumer transactions time reduced and less paper corruption cases. Imagine thousands of automobile on the road are crossing the toll counter paid by using mobile app instead of paper currency. Besides, authorities could have easily obtain digital evidence those trying to bribe a traffic officers. Time is as valuable as gold and more. Saving 10 seconds for 1 million population is a disruptive force for better society. 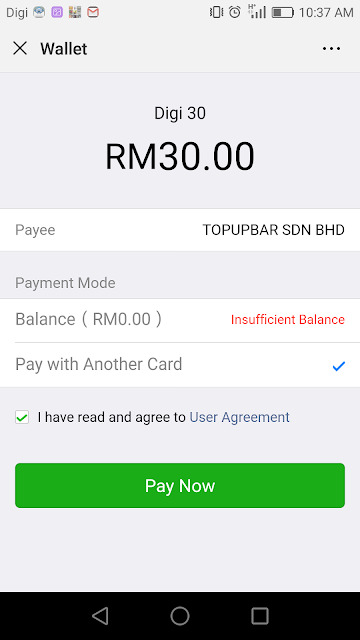 This feature will reduce mobile users dependence on small mobile store reloads their phone.In the near future, mobile prepaid cards will be redundant. Wechat is one of the most sucessful social messaging apps in the market. Neither Line or Whatsapp have this exclusive feature. 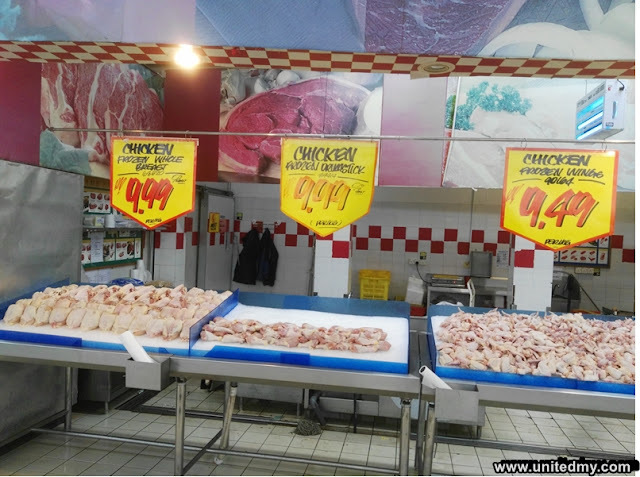 Will retail price of chicken in Malaysia reach RM10.00 price point ? 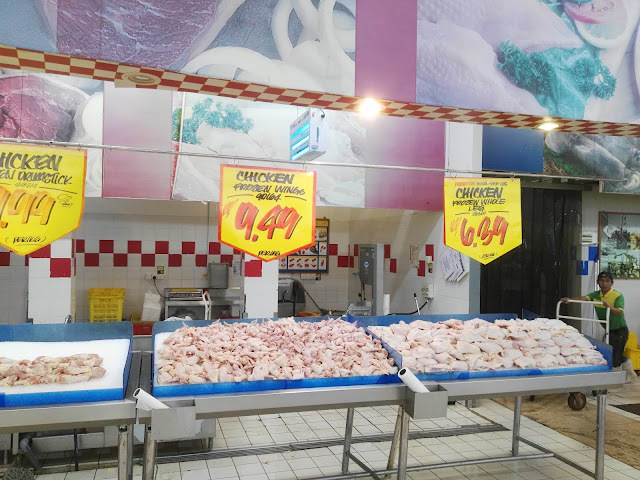 How many of you actually remember retail price Chicken you bought during festive season or perhaps during tax holiday 2018 ? *This article is not an indicator of nation economic situation and the article is meant to be self-explanatory. Most of the content are author's interpretation. It is quite interesting topic to ask how much chicken price back in 2000 ? Certainly, no one could give you a correct number. Even if you have found the actual number, average people just can't do anything about it. All we do is pointing the finger. In fact, time cant be reversed and we cant really move backward in time, people's hope for moving forward may have been the foundation for price hike. As a consumer, we can't really do anything about it but, we can be an observer. What are the force behind it actually drive the price to further up ? the cost of manpower or just pure business profit margin ? From the above logic, the price moving upward is a trend could be caused by employee wage increase, fuel increase, currency fluctuation in a sense that business will always maximize it profit in order to be competitive. The price hike is a vicious cycle that in the end of the day government gains lots of corporate taxes and could distribute the wealth back to the people. In often, the flourish of business will create wealth and potentially taking care the people too. 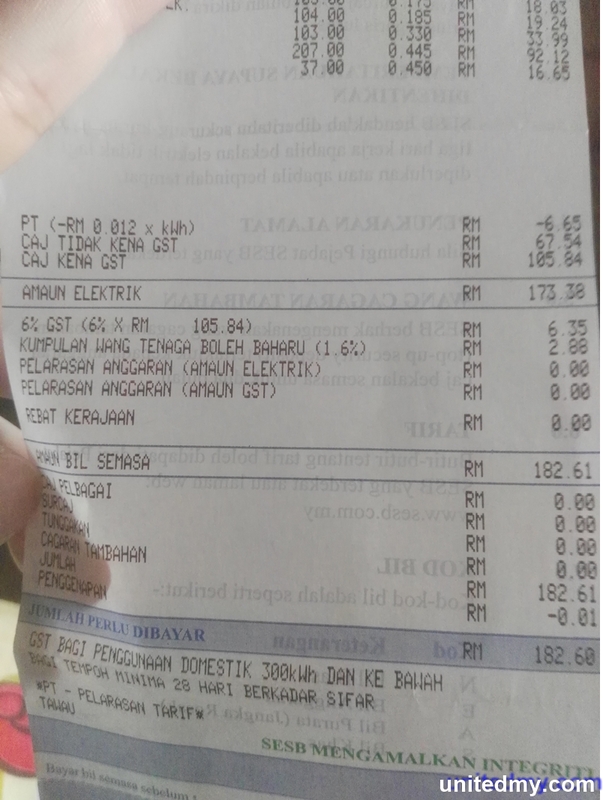 During the tax holiday, Chicken breast price did not reach RM10.00 price point. However, chicken wing and chicken drumstick hit RM12.00 price point. Is Chicken price varies among the store ? 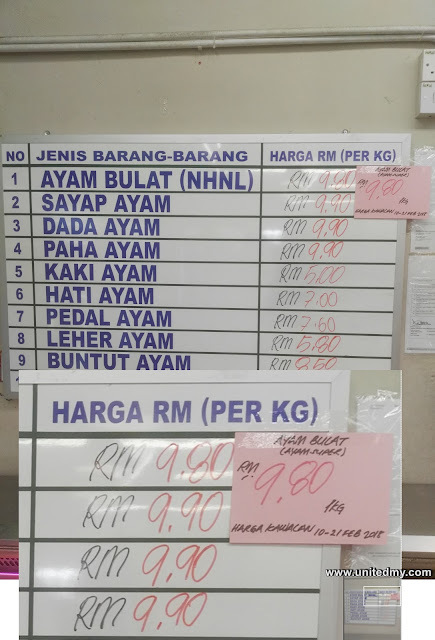 There are reasons why many times common folk pointing fingers to authorities when price suddenly have a upward change rather than business institution. It is uncommon to blame the business community because all they do is to maximize the profit and pay their tax routinely. Not to mention, there are shops everywhere selling the same stuff nationwide. The business competition is so fierce hardly any unethical practice because it will drive the particular business down, investor wealth lost lead to chicken store closing down and business have always been regarded to create wealth and use the wealth to create innovative product in a long run. There were nothing prouder when local business venture to the international stage. In fact, authorities have the majority people vote in democratic elected nation could have use machinery and mechanism to suppress any business wrongdoings or unethical profiteering. The least they can do is going out and make a campaign in the campaign speech was to encourage people turn their voices toward the business community. 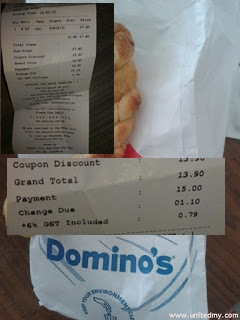 RM10.00 for chicken breast and drumstick. As for chicken wing, there are slight drop in price. Put the blame on chicken vendors is likened mistreat employees who have put lots of effort in slaughter chickens for the public consumption. Author is not trying to be smart. But, authorities could opt to fine chicken vendor association for market price manipulation, encourages more chicken produce in order to gain more chicken market supply or they could buy all the chicken in the market and sell it cheaply. Authorities should always monitor market chicken price and make an annual inflation report. 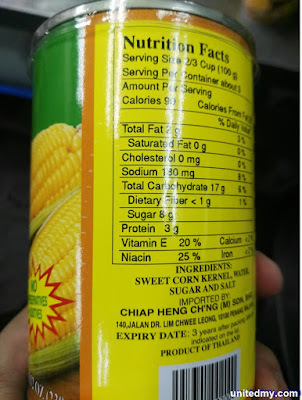 It is not transparent and efficient to just make national inflation report that includes everything likely to have intention to misled the public intelligence. Any laptop you bought on 2018 should have at least 8GB system RAM for minimal pleasure on gaming. Try a new laptopr or PC ? higher chance you will tumble on windows 10 that required minimum 4GB RAM to run. The truth is windows 10 required a constant roughly 2.5GB RAM to maintain. 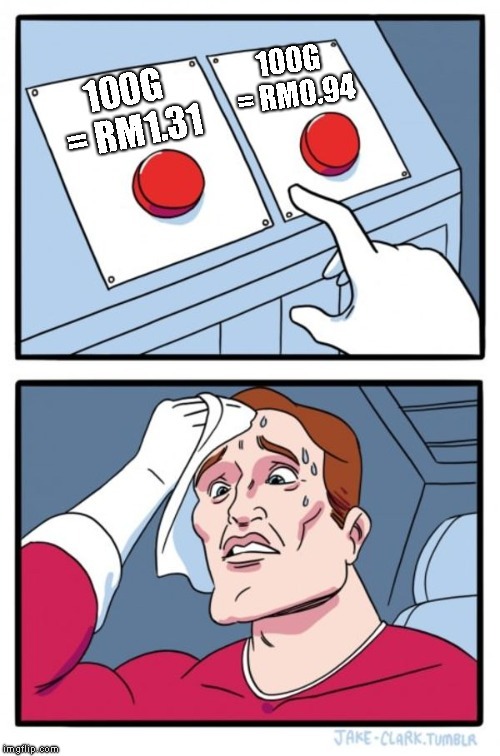 For any user activities, you are just left with estimated 1.5GB RAM. 1.5GB RAM may seem to be enough for casual web browsing and watching Youtube. In some point, you will need to run its on PC games. 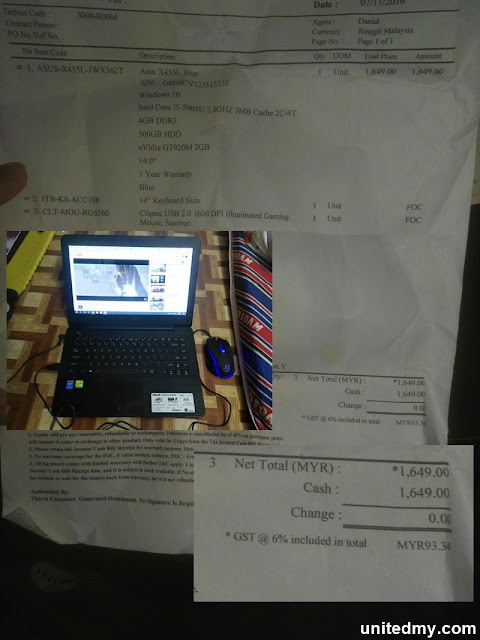 This is where everything turn sour and ugly questioning "why newly bought laptop/PC on 2018 cannot handle a 5 years old game bought from Steam ?" Experts would argue you are still able to run the game. However, the game constantly taking 95% of the RAM. There was no secret that a game still run on 4GB RAM but with less FPS and happen to have events of stutter. 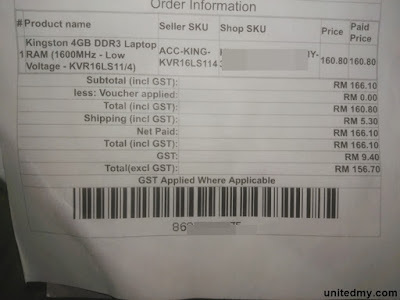 4GB RAM Laptop/PC are still widely available in today market. In fact, you just opt for higher than 8GB RAM and surely with medium to high tiered graphic card for better gaming experience. To shed a little information about GPU, any GPU running on DDR5 and 4GB VRAM are considered good for gaming. Should you accept 4GB system RAM with Nvidia 10xx series ? of course big no. 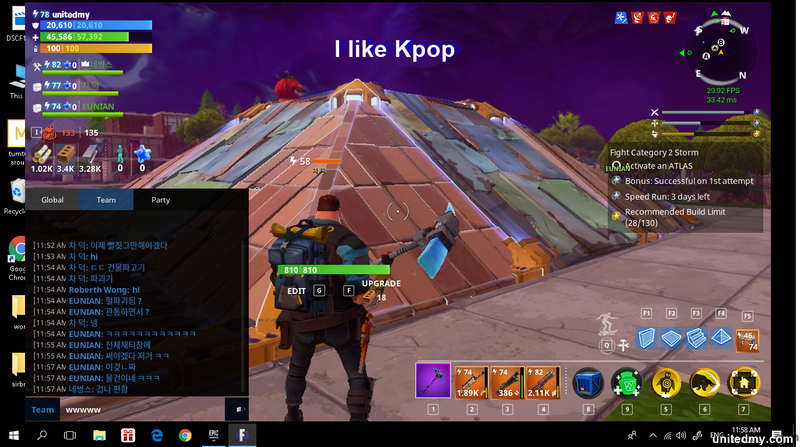 There was no better things to do than playing Fortnite right now. 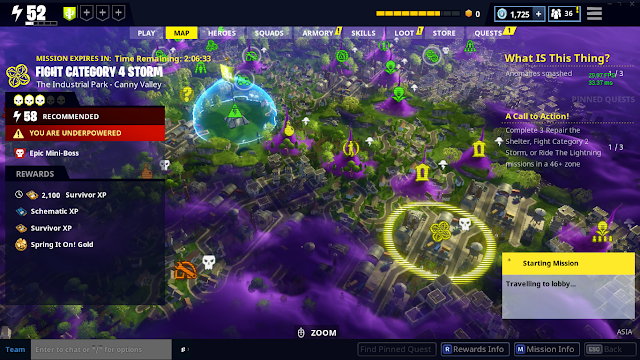 In order to further turn you off buying a 4GB RAM PC/Laptop, one of the best game genre in 2010 - 2020 Fortnite battle royale by Epic games is occupying more than 3GB RAM. As if you had 4GB RAM, it is literally unplayable for lacking 1.5GB RAM. To be frank, you could still play the game with image stuttering and imagine engaging in a large scale combat, instead of playing a game it like you are watching a frame to frame images. Emulator and PUBG mobile is taking up 1.5GB RAM. With 4GB system RAM, you will get a constant 90% RAM occupied. It is not harsh to say you could never open a single page of google chrome or even try to do a desktop refresh. Some gamer like to open voice-chat software during game and you may try to open some of your favorite song ? Here is my suggestion, buy a PC/laptop setup that come with 8GB RAM or more. In the coming years, gaming enthusiats are slowly adopting live streaming their favorite game. 8GB RAM may not be enough any longer. You may need 16GB RAM in the year 2025 ? You may watch it free of any charge in your smartphone browser or PC browser. Fret not as if you had missed Russia vs Saudi Arabia, RTM 2 would make a playback on the match. Highest resolution is 720p and for those who has limited internet speed may opt 234p for smoother video buffering. Some of the perimeter wall advertisements are visible such as Hisense, Wanda, Budweiser, Vivo, McDonalds, adidas and many more. The first goal between Russia vs Saudia Arabia was in the 11 minutes with a head goal by Russia team's "Lury Gazinsky"
In fact, relevant authorities in Malysia have suggests all Malaysian should pay no charges on important World cup 2018 matches. Previously, in order to watch every World Cup high-definition shows were needed to pay a subscription fee to a private company and only important world cup matches were shown in national television channel. Please click the link for world cup 2018 opening ceremony and watch it on Youtube. 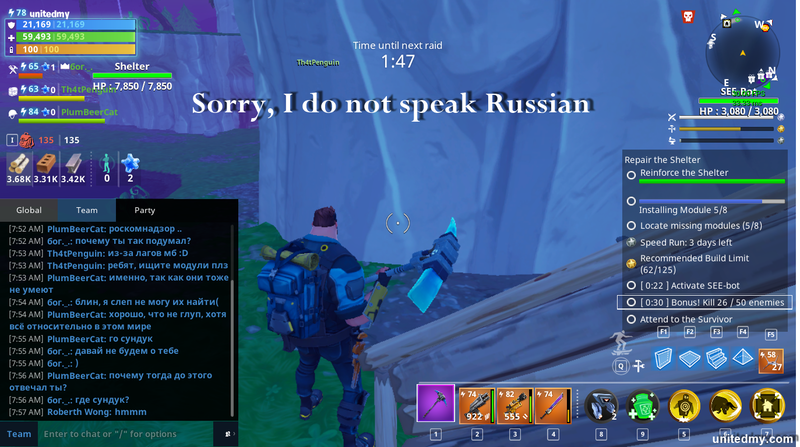 #1 fun fact is young russian are learning English language was told by one russian fortnite player in game. In conversation, they seem to be having a critical thinking about their government. Besides Korean and Russian, they are some Chinese player and not so much Philippine players. #3 fun fact Fortnite is using Unreal Engine. 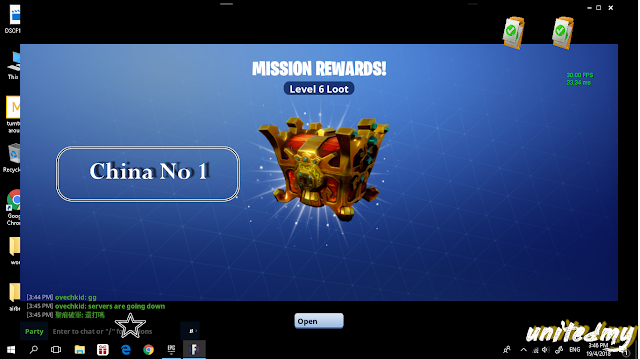 To run Fortnite, minimum requirement is 4GB RAM and recommended requirement to have system ram 8GB. #4 fun fact, there were halloween, christmas and even chinese new year limited-time theme event. Above picture character dressed in a rabbit costume was promoting St.Patrick day on April. #5 fun facts these weapons should just exist in game. There are crossbow, machine gun, pistol, shotgun, rifle, axe, sword. The enemy are zero chance against us. 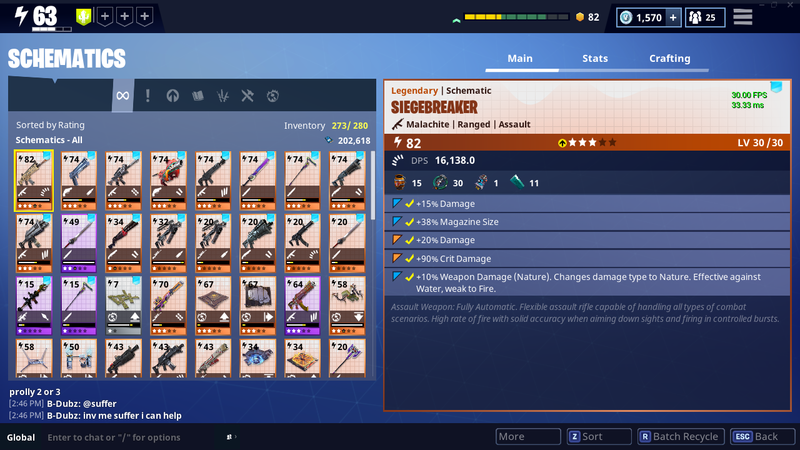 Perhaps in any zombie game franchise, fortnite has large amounts of guns to play with. Of course, Fortnite use the word "Husk" instead of zombie. #6 fun fact, there are tons of tower defense games out there, Fortnite is 3D tower defense game with guns traps and buildings. 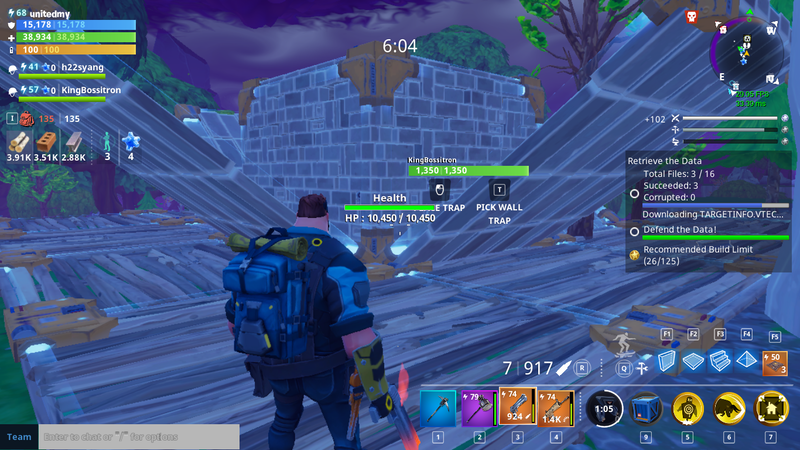 #7 fun fact, four players up against hundreds of husks with the help of guns and traps. 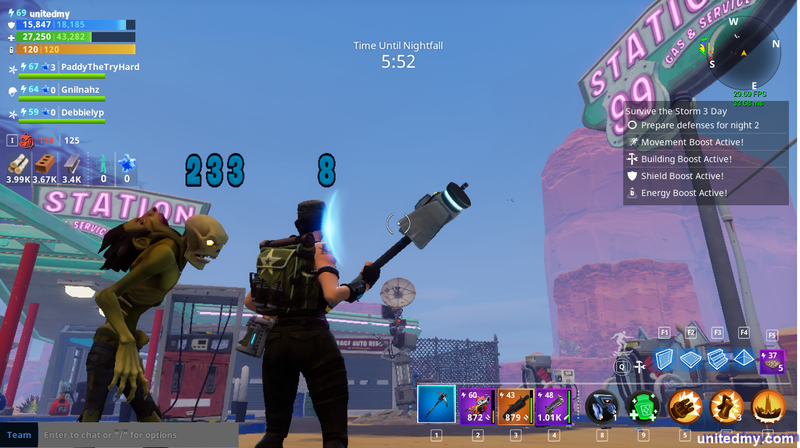 player would lose the game if husks successfully destroyed mission objective. It could be a van, a box or a shelter. #8 fun fact, endless fight with husks is not enjoyable ? 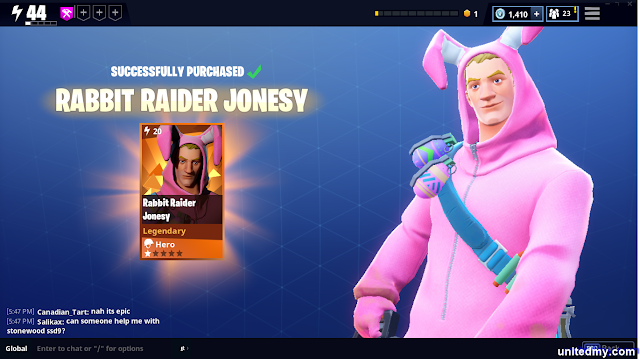 you may opt mission particularly save the survivors or building radars. #9 fun fact, mission can be 20 minutes duration or no time limit. No time limit allows player collect ammo, harvest ingredients for weapon or just purely building a mammoth traps for solo play. #10 fun fact, in fortnite narrative, husks are from a fictional storm. there are fat husk, a laser-shooting husk, a over steroid husk and most of them were purple. I do not know about killing floor 2, Fortnite is as awesome as Left 4 dead 2.